Engraving by uknown artist, published by Pieter van der Keere in 1621. 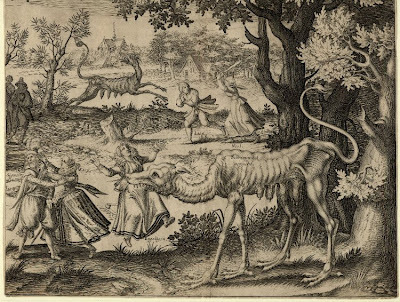 "Description- An emaciated, dog-like monster with shrivelled breasts labelled 'Schreminckel aensicht' with a woman between its jaws in the foreground of a landscape." 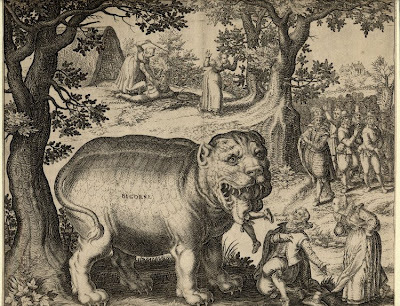 "Description - Bigorne, a large, fat cat-like monster devours a man in a landscape. With other labelled figures, including a woman (Nÿdicheÿt) beating a man (Ian goetbloet) with a stick in the background and a crowd of hen-pecked husbands queuing up at right." 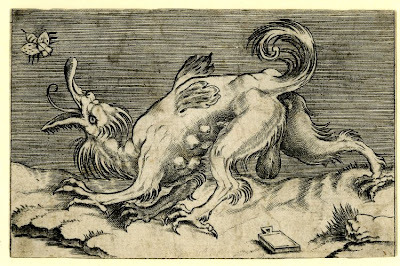 Engraving by Agostino Veneziano, 1515-1530. This is a joke against women - the fat monster is fat because it eats good men, the thin monster is thin because it only eats good women. Paul Rumsey.